The Help For Heroes fund raising match at Twickenham recently was not only a fantastic day out that will help improve the lives of injured servicemen, it was also a chance for us to see some of the rugby stars of years gone by in action once again, for possibly the last time. The big names were out in full force as guys like Scott Gibbs, Jason Robinson and Will Greenwood showed us that they haven't lost any of the edge they had in their glory days. World Cup winning Greenwood himself had a great game, crossing the tryline and showing the composure and class he had as a player. These days he's known more for his tv pundit role though, so it was great to see him out of the cheesey suit and on the field once again. We had a request for this great tackle that he put in on former British & Irish Lions prop Darren Morris early in the game. The International XV were tossing the ball about intently, but Scott Gibbs did Morris no favours with the hospital pass he presented him. A neat bit of passing, quick hands, and as Morris received the flick pass from Gibbs, Greenwood lined him up and drove the 18 times capped Welshman back hard. Great technique and timing on the tackle, and Gibbs had the right idea, but Morris barely took two steps before getting nailed. 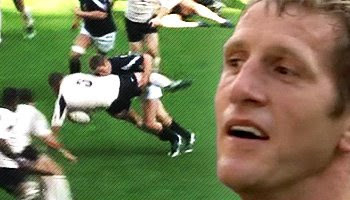 will greenwood is one of the greats, a great rugby brain and a great rugby player. overlooked if you ask me. Hes got to be the best England centre of all time, they still havent properly replaced him at ouside centre. Wow that was a good hit i must say. if we want to do well in Southe Africa we need players to put ther bodies on the line like will showed us there and if can do it i say we bring him in to the lions!!! !